As HDTVs become paper thin with nearly invisible edges, there is very little room for internal TV speakers. That’s why it’s practically a no-brainer to improve TV audio with a sound bar or sound base. In this review we examine two options that each cost $250. The Vizio S4221w-C4 is a 42-inch soundbar that comes with a wireless subwoofer. Meanwhile, the ZVOX 350 SoundBase sits under your TV instead of in front of it. 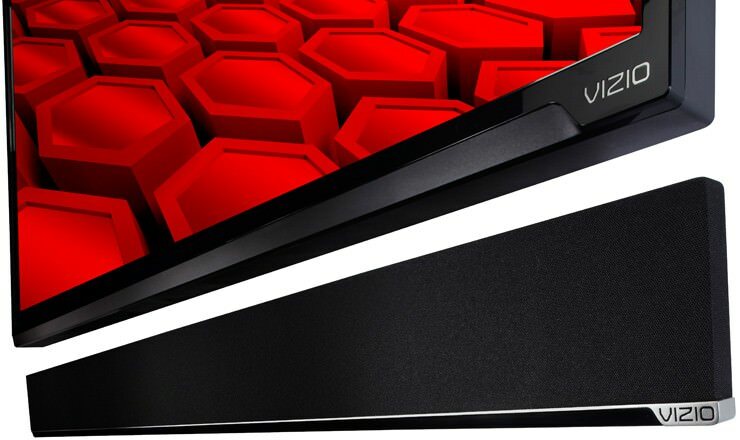 The VIZIO S4221w sound bar should be positioned directly in front of your TV. The wireless subwoofer can be placed anywhere in your room, but needs to be plugged into a power outlet. Hooking up the soundbar requires just one optical cable connection from the back of your TV into the sound bar, along with a power cable. Once it’s turned on, the sound bar automatically locates the wireless sub and everything just starts working, kudos! This video by VIZIO below explains it all. Since there is no external subwoofer, the ZVOX 350 is even easier to setup, except you might need someone to help you lift your TV up over it. The ZVOX uses the same optical connector along with a power cable. 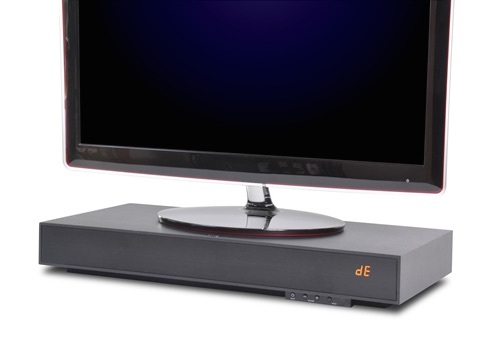 There is no external subwoofer, and no mounting capability, although the SoundBase can sit on a console table beneath a mounted TV. The final setup step in either case is to turn off your TV speakers. That is done via your TV’s on-screen menu. Both $250 speakers will instantly make TV shows and movies sound better, but sound quality of each is different. Since the VIZIO has a subwoofer, it will give the impression of fuller sound and make explosions sound better. For it’s size and price the subwoofer performed as I would expect, which is to say it adds some boom to music and movies, but it’s not going to shake the room. The ZVOX is unbelievably detailed, and it has the unique ability to sound bigger than it is. Plus, it can make sound appear from different places in your room. It’s quite amazing, thanks to ZVOX’s proprietary PhaseCue virtual surround processing. There are three low to high surround settings (Sd1, Sd2, Sd3) you can experiment with, along with a handy Accuvoice button to emphasize voices when needed. The VIZIO has none of this. ZVOX says model 350 is designed for 27” to 42” TVs, but it can just as easily sound great with larger sets, assuming the TV stand can sit on it. Unfortunately, late model Sony and Samsung HDTVs have stands wider than 23-inches (the width of the SoundBase 350). To solve this ZVOX makes even wider SoundBases, but you’ll pay $50 more for each step up in width. Therefore, check the width of your TV’s base before buying any ZVOX. However, for sound bars (including VIZIO’s), you should also measure to make sure the speaker doesn’t block the lower part of your TV. The VIZIO S4221w stands 3.74” tall, and did block the screen of my Sony BRAVIA TV. Of course, wall mounting negates that problem and the VIZIO comes with everything you need to get it mounted. Both come with a remote control, which you’ll mainly use for volume and power on/off. The VIZIO remote has a LCD readout screen to let you know what is selected, whereas the ZVOX is all buttons. Although, you’re likely to ditch each remote once you program them into a universal remote. The one case you might want it nearby is to enable Bluetooth for music streaming from a phone or tablet. 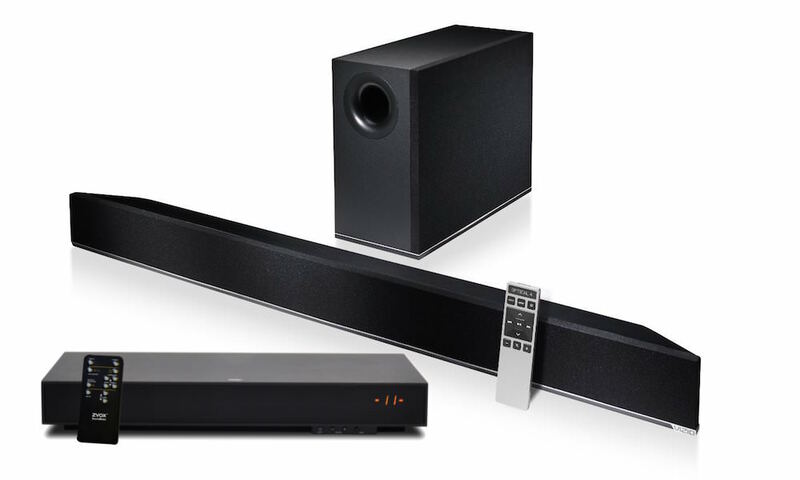 They both have Bluetooth, which is a great add-on that older sound bars generally don’t have. The only drawback to such setting is you, or another family member, need to remember to switch back to TV mode manually when needed. I do have to admit, the ZVOX surprised me the most with its surround sound capabilities. Even with my open floor plan, I was still able to hear surround effects. In addition, it is a very capable Bluetooth speaker in stereo mode. I preferred its musical quickness over the VIZIO, which does offer deeper bass. For $250, both are an incredible value, and a worthy upgrade to any TV. I’d take the ZVOX 350 in this head-to-head test, mainly because it sounds more detailed for both music and TV. Just remember to make sure it can fit under your TV. On the other hand, you might find closeout deals on the VIZIO S4221w, which is about to be replaced by a newer model. Either way, you should not be listening to TV speakers alone. Get a sound bar! Also, don’t miss our picks for Best Sound Bars!